Heat oven to 325°F. Lightly grease 2 donut pans. In a large bowl, stir together Bisquick™, cake mix, sugar and salt. Add milk and eggs. Stir until well combined. Pour batter evenly into donut pans, so each donut cup is about 3/4 full of batter. Bake 10 minutes until donuts spring back when lightly touched. Cool 10 minutes in pan, then transfer to a cooling rack to cool completely. Meanwhile, make the glaze: In a small bowl, stir frosting and pineapple juice until a thick glaze forms. When donuts are fully cooled, drizzle tops with the glaze. Sprinkle with chopped walnuts, if desired. These donuts are baked, not fried, so they're easier than ever. There is one thing that has completely changed my life for the better, and that thing is a donut pan. Okay, okay, I guess marrying my husband and having my family counts, too, but ALSO – donut pan. Why? Because I can make things like Carrot Cake Donuts with Pineapple Cream Cheese Glaze, that’s why. And you’ll need a donut pan to make them, too. But trust me, it’s worth it. IT WILL CHANGE YOUR LIFE. Here’s all the goodness you need to make these here donuts (besides a donut pan). Betty makes a mean carrot cake mix, so we’re going to add that magic, plus some Bisquick, milk, sugar, eggs and salt. The frosting comes in later, don’t worry! Mix the donut ingredients in a large bowl until well-combined. Easy so far. Pour the batter evenly among two doughnut pans (unless you have one of those fancy ones that makes 12 at a time, in which case you only need one. Lucky you). Bake the donuts until they spring back when lightly touched. Still easy! Let them cool in the pan for 10 minutes, then transfer them to a cooling rack to cool completely. Okay, it's a little difficult not to eat them already, but still, easy-peasy. Sprinkle the tops of the donuts with chopped walnuts, too, if that’s whatcha fancy. Boom! 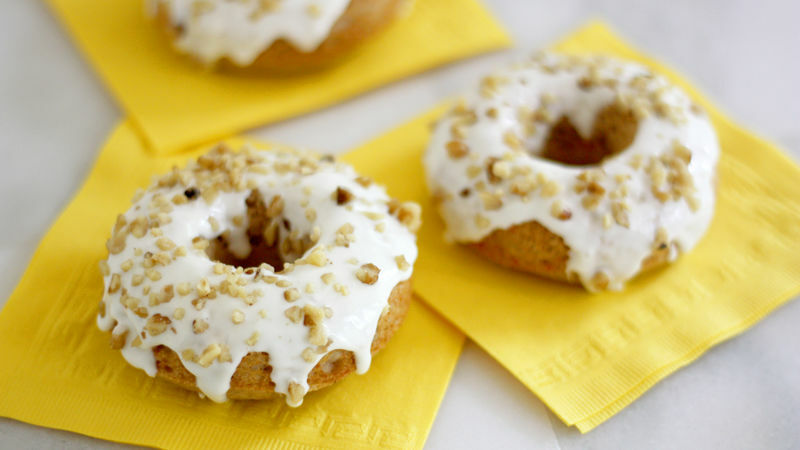 Easy, tasty, life-changing carrot cake donuts, in yo’ face. Stephanie (aka Girl Versus Dough) is serious about that doughnut pan, you guys. Check out her Tablespoon member profile and keep checking back for her own personal recipes!